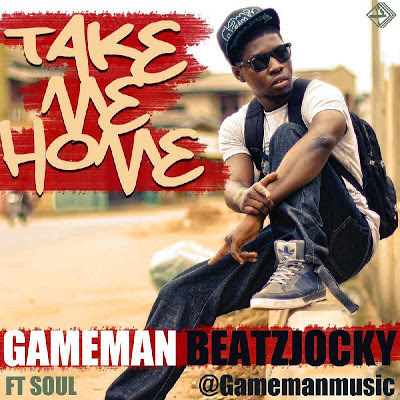 The guys from Groovement Minis3 promised earlier,to drop new music for 8 weeks, this is the fourth installment from the group titled "Take Me Home" by GameMan BeatzJockey featuring SOUL,which also is the first official single from the forth coming Beyond Words Album. Here GameMan BeatzJockey performs the duties of a Rapper and Producer. This track is a blend of Hip-Hop beat and Ragga flavor. Mixed and mastered by the profilic ''Mr Oyaaa'' Okey Sokay. This song talks about the 'prodigal son' experience. Moments when we find ourselves lost, distracted, down and out or lacking the strength to move on. Then we can simply cry out to our Lord and King; and He'll be sure to come to our rescue. Olumide Akindele Okesanjo, A.K.A (GameMan 'GAMIE' BeatzJockey), Rap artist, music producer and Director. Born and raised in Lagos state, attended St Michael’s Model school for primary education, Abesan High School for secondary and Lagos state university (LASU) where he obtained a B.Sc degree in Computer Science. Started out as a drummer in a local church, then singer in a group called Peculiar Treasure. Broke out of the music group to pursue his music career not as a drummer, singer, but as a rapper. This was due to heavy exposure to all kinds of music genres which he then used to create for himself a unique style and identity. Inspired by life, environment, society, and all that’s available through God. A quick listen to his songs gives an idea of his personality and convictions. Very practical; his music is known to take the listener on a journey. It’s a perfect blend of key musical elements. He’s got a unique voice texture, intelligent techniques used for delivery and superb clarity that makes you hear every word. GameMan BeatzJockey is known for his multi-tasking abilities. A personality with unique sense of leadership. He is Chief of the E.C.H.O Cypher project where he teams up with Mr Xi CEO (E.C.H.O) to set up the E.C.H.O Cypher platform. On the platform he performs the task of a director, music producer and Rapper. Featured on songs with top artists and producer like FLO (God rest ye merry gentlemen & Yahweh), Midnite Crew (E gimme money), Bouqui (Church Boy swag), just to mention a few. Presently working on his album titled ‘Beyond Words’, and recently released the much awaited ‘RiverSide EP’ a 6 track EP and a bonus track titled Cruci-FIX.